The Japanese Stone Lantern at the Tidal Basin is lit just once a year, during the Cherry Blossom Festival. 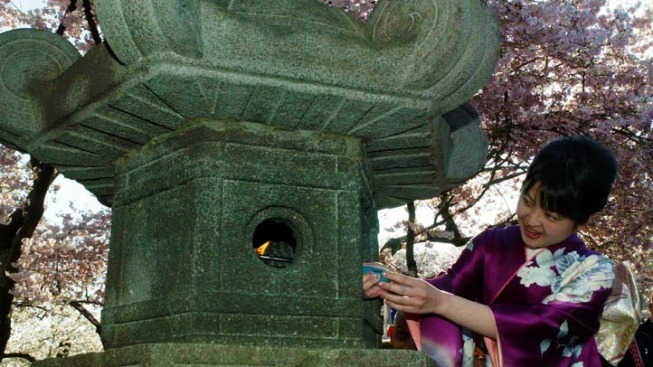 An annual tradition that accompanies the Cherry Blossom Festival took place Sunday along the Tidal Basin: the Japanese Stone Lantern lighting ceremony. The lantern was carved some 360 years ago. It was first lit back in 1651 to honor the Third Shogun of the Tokugawa period. The lantern was given to Washington as a gift in 1954 to symbolize peace and friendship between Japan and the United States. It's only lit once a year, during the National Cherry Blossom Festival. It is the oldest freestanding man-made stone structure in Washington, D.C.